This article is for guitarists who want something better than a clip-on tuner, but aren’t looking to spend a fortune on a studio rack. The happy medium is a pedal tuner that fits on your board just like a regular FX pedal. The thing is, not all tuner pedals are equal. Some are more error prone than others (*ahem* PolyTune), which is the last thing you want when you’re on-stage and the band is waiting. Read on for our analysis of the best tuner pedals. *Cents are units of pitch, with 100 cents in a semitone. Experts say the best you need is +/- 1 cent accuracy, given the limitation of the human ear. To the left is your low E string, and the right, your high E.
In theory, this makes tuning much faster. You can immediately see which strings need adjustment. Then, pluck the individual string to fine-tune it. The PolyTune automatically switches from multi- to single-string mode based on input detection. The multi-string visualizer isn’t super detailed, so you’ll often be plucking single strings to get them fine-tuned. The problem is, the polytune has a hard time detecting when you’re playing a single note vs a full strum. It constantly switches back and forth between the two screens. Furthermore, even when it holds onto single note mode, it often jumps between pitches. The Polytune is especially glitchy when there’s background noises (or vibrations); making your panicky on-stage tunings all the more dreadful. Nothing is more frustrating than this tuner switching between modes and pitches because your bassist is playing an interlude. Granted, even in a dead-silent room, I’ve found it cumbersome. 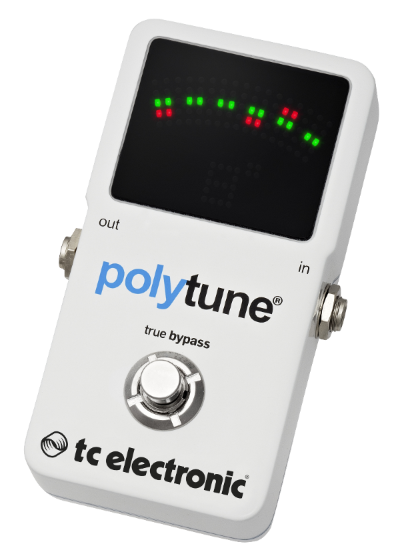 The PolyTune can only handle standard and drop D tunings in a variety of pitches. For example, it can accommodate if you tune down a whole step, or use a capo on the 5th fret, but it can’t handle DADGAD, Open G or any other alternate tunings. The pedal has an advertised accuracy of +/- 0.1 cents, which is better than the Boss or Korg. However, unless this is for solo-use only (without a band) and you’re OK with the limited tuning options, I would skip this pedal. In 5 years the technology may get there, but as of now, it’s not worth the hassle. “Always On” mode allows you to keep the tuner running while you play. The previous edition automatically muted your signal when you tuned. While I have not yet tested the PolyTune 3, I have to assume it has the same issues with finicky detection. TC Electronic did not note any upgrade to these components in their release notes. The Korg Pitchblack seems to solve every issue with the PolyTune. It does a much better job of detecting and holding pitches. It responds quickly (almost instantly) when you pluck a string, and its visualizer is by far the brightest and easiest to see on stage. On the flipside, it is NOT a polyphonic tuner -- it will not tune multiple strings at once. But I will say that, frankly, this should not be a deciding factor. Polyphonic tuning should be left in the “nice to have” category. Speed: How quickly does it find and display a pitch? The difference between 0.1 and 0.5 seconds can make a remarkable difference when you’re on stage and in a pinch. This is roughly the difference I’ve noticed between my Pitchblack and my Snark tuner. Reliability: How well does it hold the pitch? Does it peter out right away, or does it sustain nicely as you turn the tuner? This is, again, one of the biggest advantages of the Pitchblack. It seems to hold the pitch indefinitely, and it's not distracted by outside noises/vibrations. Legibility: How easy is it to read the tuner, despite glares from the stage lights, hazy rooms, drunk singers, etc? Again, the Korg Pitchblack beats out all other pedals in my opinion. Especially compared to the Boss TU-3, which can be difficult to read. This video was made by TC Electronic, the makers of the PolyTune, but I think it still shows the Korg Pitchblack as the clear winner. Boss has long made popular pedal tuners, and the TU-3 is no disappointment. It’s built like a tank, and comes with some handy knick knacks, like a high brightness mode for outdoor use. Accuracy-wise, the TU-3 is a big improvement over its predecessor. It detects pitches within +/- 1 cent (same as the Pitchblack), compared to +/-3 cents for the TU-2. Is this a bad thing? No, not necessarily. A good buffer placed placed first in your chain can help you maintain signal quality -- especially if you’re using long, tone-sucking cables. On the flipside, buffers don’t always play nicely with other pedals (e.g. fuzz pedals) and some say that too many buffered pedals in a chain can, likewise, hurt your tone. I recommend this article by Roland for more about true bypass vs buffered guitar pedals. Deciding between the Pitchblack and the TU-3, I ultimately settled on the Pitchblack for its lower price, larger/clearer display and faster tuning response. The TU-3, however, isn’t a bad option -- especially if you prefer a buffered pedal. A stage tuner has 3 things to do: Deliver the pitch as quickly, accurately and clearly as possible. It has to do this regardless of exterior noises/vibrations, and light condition. Based on these factors, I eventually settled on the Korg Pitchblack, and have been very happy with it ever since.